To hear Alexander’s story read by Ewan MacKay; please press play on the audio file. Alexander Sutherland was born on 29th May 1884 to Alexander and Williamina Sutherland. His father was a fisherman and they lived in the village of Gospie. Alexander joined the Navy at an early age, but he left in 1905 when he was 21 years old. Alexander married Irvinia Davidson and they had five children. He was employed by Perth Tramway Company and the family lived in Perth Road, Scone. 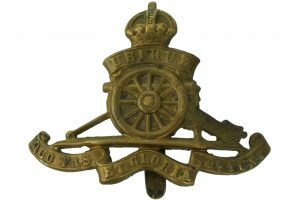 Alexander enlisted into the army on 16th October 1914 and joined the Royal Garrison Artillery. After his initial training, he was mobilised to France and experienced various battles on the Western Front. Gunner Alexander Sutherland was killed on 6th August 1916 during the Battle of the Somme. He was 32 years old. He is buried in Perrone Rd British Cemetery, South of Albert. Alexander was awarded the Star, Victory and British War medals.